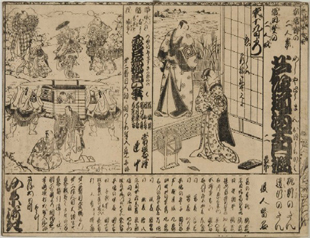 Printed materials have long been a part of theatre history in Japan. From spectacular scene illustrations to performance programs to actor portraits to training manuals for staging, lines, or music, prints have been used both in and beyond production, before and behind the curtain. In this module we present illustrated essays on the uses and contexts of various types of print materials in the noh, kabuki and puppet theatres. We include interactive pages on how to read the elements of different types of historical kabuki programs (see Kabuki banzuke), a slide show of a scroll documenting an early-modern period noh public production, and many other topics. Specialized vocabulary terms are linked to glossary entries where full definitions and further examples of the terms are provided. Portraits of actors, in character and out. How to read historical programs.